Chop the ham, onion, carrot and celery, put them into the casserole along with .carni, oil and butter. Stir, taking over low heat for a few minutes, raise the heat and add the wine and 1 / 2 cup of broth. Allow to consume, then add again the same amount of broth. Allow to consume more, add the chopped tomatoes, season with salt and pepper and let it cook slowly in a covered container for about and hour 1 30 min. NOTE: II meat sauce and tomato, typical condiment for pasta, lasagna, etc., Has become one of the symbols of traditional local cuisine and Emilia Romagna, even if it is used, with numerous variations, a bit 'in all Italian regions. To season dry pasta, especially fresh pasta, such as tagliatelle, fettuccine; to fill the Bolognese lasagna. Do you know this recipe of Emilia-Romagna cuisine? Contribute to this project too! 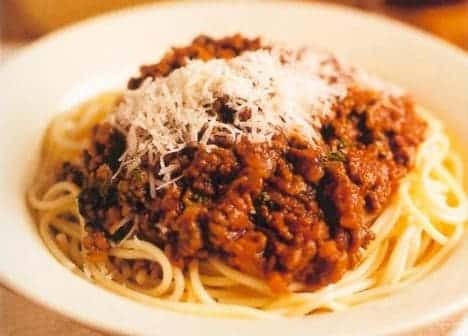 Publish your images of "Bolognese sauce".